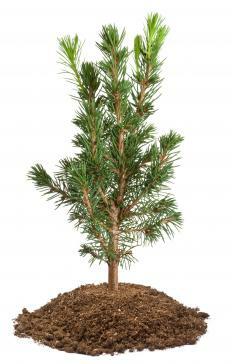 A tree sapling can range in height from 2 to 10 feet. Tree saplings are slender, immature trees ready for planting. A tree sapling is an immature tree with a slender trunk. Depending on the species of tree, a sapling can be between three and 15 years old, and range in height from 2 to 10 feet (about 0.61 to 3.05 m). Saplings differ from seedlings, which are trees that are less than three years old. The principal attributes of a tree sapling, aside from its age, are trunk flexibility and smooth bark; mature trees generally have thicker, darker outer bark. Ordinarily, saplings do not produce fruit or flowers. In most cases, the best stage at which to plant a tree is when it is a sapling. Seedlings, because of their small size and lack of development, are considerably more vulnerable to physical damage and disease. In contrast, trees that are larger than saplings are difficult to move because of their size and extensive root structure. When planting a sapling, its size and shape at maturity should be taken into consideration. For example, the growth of a mature tree may reach overhead power lines; alter the scale of the landscape in relationship to buildings; or drop branches, leaves, and flowers in undesirable areas. Large roots can eventually enter and damage pipes in the ground or buckle nearby sidewalks and driveways. Another consideration when planting a tree sapling is determining what areas it will shade when it grows to maturity. Air conditioning bills can be considerably reduced by the proper placement of a shade tree. Conversely, shade from the same tree might prevent light from reaching a vegetable or flower garden. 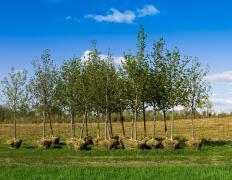 Tree saplings are usually purchased in a container or with their root balls wrapped in burlap. The optimum time for planting saplings is during the fall while the ground is still warm, which can encourage root growth. Supplemental watering may be required for a year or two after planting, at least until the complete root system has developed. An advantage of tree saplings is their flexibility, which typically permits them to be trained into different forms and shapes. A fruit tree sapling can be espaliered by trimming off branches and using wire to encourage the tree to grow in one plane parallel to a wall or trellis. This enables the fruit to grow larger due to the warmth reflecting off the underlying surface. Tree saplings can also be bent, causing them to grow horizontally as indicators of property boundaries or landscape borders. 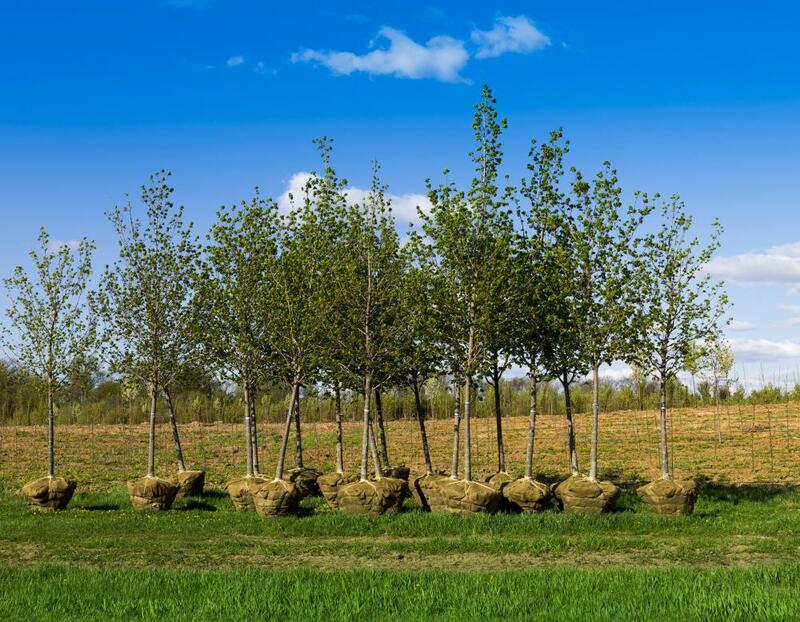 The flexibility of tree saplings helps them bend in storms and avoid serious damage. How Do I Plant Oak Seedlings? What is a Blue Oak? How do I Plant a Blueberry Tree? How do I Plant a Juniper Tree? @malmal - No, bonsai tree saplings aren't any smaller than regular tree saplings, nor are they a special species. Breeding trees to be tiny and genetically modifying tree seeds to grow smaller and smaller adult trees is a practice called dwarfing, which is confused with bonsai a lot. Bonsai is the practice of growing a regular-sized tree sapling in a special small pot and pruning it, reducing its roots and more in order to eventually grow it into a full-sized tree's shape and appearance while keeping it to a tiny size. Bonsai trees take decades to grow -- you might want to just buy one if the result is what you want, rather than the growing experience. If you want the growing experience, though, by all means, start a bonsai tree sapling growing and have fun with it! Hi there. I'm really curious about something that occurred to me after reading about tree saplings here on WiseGEEK -- are tree saplings for bonsai trees tiny compared to other saplings? I mean, I read that bonsai trees stay so small because they're raised in pots, so I guess my question is, if I planted some regular pine tree saplings in pots, would they stay tiny? Or are they a different species of tree entirely, and the saplings start out really tiny? I'm toying with trying to grow a bonsai tree, but I don't know much about them. They just appeal to me. Anybody know anything about them? I'm a big advocate of replanting and keeping trees around for cleaner air. I give out free tree saplings every Arbor Day to encourage people to plant more trees and to appreciate nature. Trees do a lot for us -- and though a grown tree might take up a lot of space, for many species that takes decades. Fitting a little tree sapling into your life is pretty easy -- if you know somebody who owns their own land, you might even be able to plant it there. @ahain - Some kinds of trees grow slower than other kinds. I'd imagine the ones that are still saplings at age 15 are probably the slowest-growing types, like oak trees. The easy way to tell if your fruit trees are still saplings or not is whether they produce fruit. If they do, they're mature trees and shouldn't be moved or yes, you will kill them. Sometimes a grown tree can be successfully moved; early spring is the best time to do this, as the tree will still be dormant from winter but will soon have the warmth and water to encourage it to grow into its new place. Ideally you want the tree to "wake up" in its new place and keep growing like it was never moved. Be very careful with the roots when transplanting! Wow, a tree can still be considered a sapling when it's 15 years old? I wonder what kind of tree that applies to. I know the kinds of trees that I deal with, which are fruit trees in an orchard, would be a mess if I tried moving them when they were 15 years old. They would probably die.